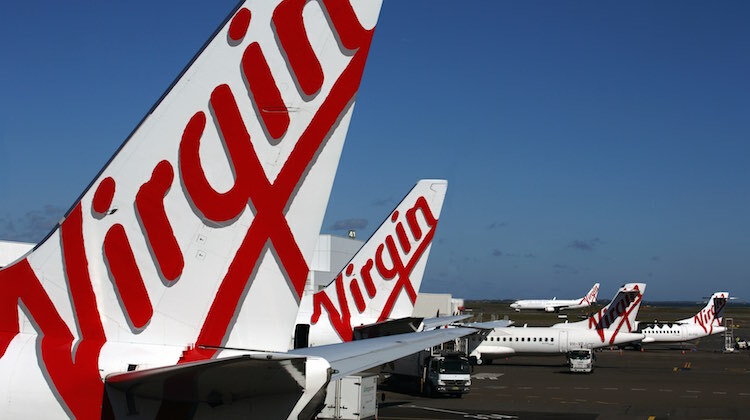 Virgin Australia’s major shareholders have tightened their already strong grip on the airline after smaller shareholders largely passed on the airline group’s capital raising. In a statement to the Australian Securities Exchange on Tuesday, Virgin said 89.5 per cent of shareholders had taken up their entitlements to buy one new share for every share held at a price of 21 Australian cents per share. Given five entities – Etihad Airways (21.83 per cent), Singapore Airlines (20.09 per cent), Nanshan Group (19.98 per cent), HNA Group (13.04 per cent) and Sir Richard Branson’s UK-based Virgin Group (8.66 per cent) – controlled a touch under 84 per cent of Virgin stock prior to the capital raising, the result indicated the bulk of smaller shareholders chose not to participate in the offer. The five investors, and Air New Zealand, which held 2.54 per cent of Virgin’s shares on issue prior to the capital raising after bailing out of the Australian carrier in June, had committed to take up their full entitlements. Virgin will still be able to collect the full $852 million it was seeking from the capital raising because SIA, HNA and Virgin Group made binding commitments to mop up the 424 million new shares not taken up. Further, HNA group will receive a separate top-up placement of shares priced at 26 Australian cents per share to lift its shareholding to 19.2 per cent. The $852 million capital raising, as well as a separate $159 million share placement to HNA that was completed in June, brings to $1.1 billion Virgin has raised as part of efforts to boost its balance sheet, repay a $425 million shareholder loan and reduce debt. “We are very pleased that shareholders have shown their support for the group through their participation in the offer,” Virgin chief executive John Borghetti said in the ASX statement. Meanwhile, a Virgin spokesperson has confirmed a report in The Australian Financial Review newspaper on Tuesday that chief commercial officer Judith Crompton and chief operating officer Gary Hammes have resigned and would leave the company in September and August, respectively. Their departure comes as Borghetti’s new hire John Thomas prepares to join Virgin as the boss of its domestic and international operations at the end of September. Thomas, an Australian, was most recently a managing director and partner of LEK and head of Asia Pacific based in Boston, where he headed the consulting firm’s aviation and travel business. He has been credited with the introduction of checked baggage fees among US carriers. At the time his appointment was made at the end of June, it was understood Crompton, Hammes and chief customer officer Mark Hassell would report to Thomas under a new management structure. In turn, this would free up Borghetti from some of the day-to-day management of the airline to focus on establishing Virgin’s operations in China and Hong Kong as part of its strategic commercial alliance with HNA Group. The appointment comes as Virgin moves to reduce costs and improve its financial performance through the withdrawal of aircraft and staff cuts. It has been reported Virgin was targeting a 10 per cent reduction in management positions across the company. Borgetti introduced Thomas at the launch of Virgin’s new business class cabin products on its Boeing 777-300ER fleet in Los Angeles in late July. “John will joining us in September,” Borghetti said. “He will be group executive of the Virgin airline and he will be my right hand. Currently, Crompton is responsible for alliances, network, revenue management and sales for the airline’s domestic and international network; Hammes looks after the day to day running of Virgin mainline covering areas such as engineering, ground, flight and network operations, among other tasks; while Hassell oversees product and service development, marketing, brand management, customer relations, lounges, cabin crew and customer service.